A strong, hard, tough, abrasion resistant film that retains its useful properties over a broad range of temperatures. Frontsheet films made from ECTFE are used in place of glass to reduce the weight of photovoltaic (PV) modules or to allow the construction of flexible PV modules. The Frontsheet serves as a protective barrier for the interior workings. Critical film requirements include low water vapor permeation and excellent UV resistance, a high degree of visible light transmission, service life from 10 to 25 years, and in some cases, increased mechanical impact strength. Our Hyperion film product line, produced by Griff Photovoltaic Films is a strong, hard, tough, abrasion resistant film that retains its useful properties over a broad range of temperatures. This film exhibits outstanding low temperature properties, especially those related to impact. The film delivers good tensile, flexural and wear resistance properties. Extremely resistant to UV radiation and common industrial and environmental pollutants. ECTFE (Ethylene Chlorotrifluoroethylene) is a strong, hard, tough, abrasion resistant film that retains its useful properties over a broad range of temperatures. 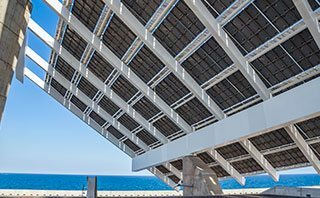 ECTFE also has excellent weathering properties in relation to UV radiation and is ideal for photovoltaic frontsheet applications. The solar backsheet is the outmost layer in the module and protects the PV cells from environmental and other external conditions that can damage the fragile PV cells.